One 10" tall vase and two matching 6.75" Vases. Includes etching all three pieces and the sand in the vase. Includes etching all three pieces. 3 pieces - Heart vessel and two pouring vessels. The set also comes with a third pouring vessel. This is perfect for second marriages to have the children pour a little sand first into the heart vessel. 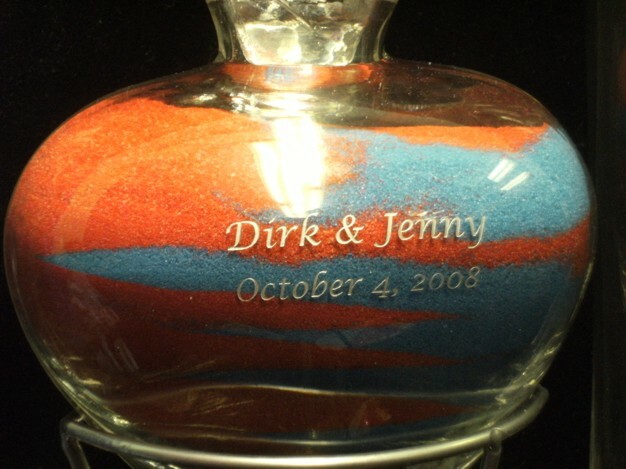 Includes first names and wedding date on heart vessel and first names on pouring vessels. The main vessel unit is 10.5" tall and the pouring vessels are 7.5" tall. This is the cute one at a great price! 4 1/2" Tall. Great for a destination wedding. - easy to pack. 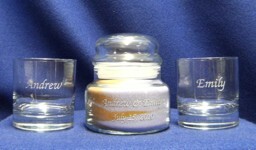 Includes first names and wedding date on jar and first names on pouring vessels. Sand symbolizes time. We were formed from the earth and when we die we return to dust. The Hawaiians have used sand in the marriage ceremony for years. Many of their weddings are performed on the beach. During the ceremony, the couple reaches down by their feet and scoop up sand in their hands. They combine the sand into a jar saying some words of their choice. 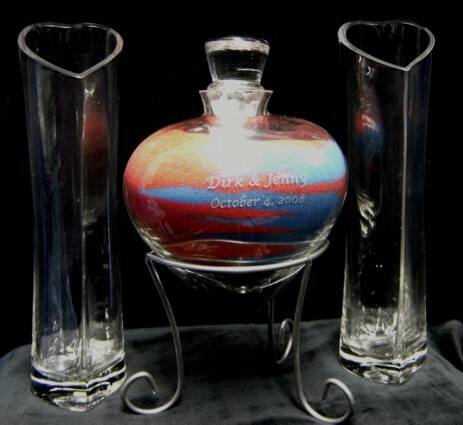 The glass jar is then taken to their new home to symbolize the new union. Once the sand is poured together it can never be separated – the sand becomes one – as in marriage. This simple ceremony has now become popularized. Some time ago, the Bachelorette TV show used the Unity Sand Ceremony and the rest is history. Many couples like the Unity Sand Ceremony better than the Unity Candle Ceremony because the sand will last forever – the candle is eventually consumed. Now you want to use the Wedding Sand Ceremony in your Wedding - Don't mess it up. You want it to be a beautiful part of your ceremony. Disaster could be awaiting your sand ceremony. By a little planning and preparation, embarrassing mistakes can be avoided. Here are some tips to avoid embarrassing moments during the Unity Sand Ceremony part of your wedding vows. 1. Make sure you have enough sand. Most vessels hold about 3 lbs. of sand. Most likely you will need 1 1/2 lbs of sand for each of you. I suggest you fill the vessel with sand and find out for sure before the ceremony. 2. Practice pouring the sand before the ceremony. Do you want to alternate pouring the sand or both pour at the same time. Especially if pouring at the same time, make sure your two pouring vessels don't hit each other. You may need to buy a glass funnel to avoid the problem. 3. If you have a child pouring sand in the main vessel have him or her practice also. You may find you need a shorter table so they will not spill the sand. 4. Think about the length of time it takes to pour the sand. Does it match up with the time vows being are said? 5. Make sure the table is on stable ground and will not shift over the short period of time during the ceremony. You may want to purchase furniture coasters for the table to set on. 6. Place the Unity Sand Ceremony table just to the left or just to the right, so the couple and pastor can smoothly go to the table for the unity ceremony. 7. The Sand Ceremony table should stay in one location during the whole wedding ceremony. Don't move the table to the center and move it back after the Sand Ceremony. This takes way too long to do. And why take a chance of knocking over the Unity Sand vessels. 8. After the wedding, when transporting the Unity Sand Set, have a way to keep the sand from spilling or shifting in the vessel. You want to keep the sand in its unique position after pouring. Here is a video that shows several mistakes. Notice the awkward moments and the laughter of the couple when the pouring vessels clink. Notice the length of time moving the table and how hard it was pouring the sand. All problems you want to avoid. Here is video doing everything right. The video shows the Wave Sand Ceremony Set and suggested vows to use for a second marriage with children. You can purchase the Wave Sand Ceremony set on the left side of this page. Colored Sands can be purchased at craft stores like Michael's or from us.